With the recent (a bit late, sorry) release of the movie, we have decided to appoint this as our first book to read and discuss for the month of April. We will be discussing this on Twitter on the 27th of April (Saturday), so don't forget to take note of the date! You can purchase a copy from http://www.opentrolley.co.id (cheapest price) or download the ebook (for free. Yes, I love you too) down below. 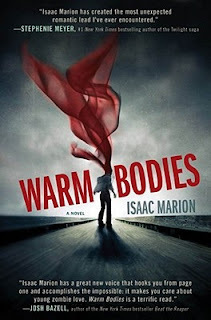 Warm Bodies by Isaac Marion ---> Free Download. That's all for today. I've started reading this and I'm in love with Isaac's writing. Anyway, hope you guys will participate in this month's book club! Till next time. Happy reading!